In the center of the huge frenzy the miracle gadget fidget spinner stirred, experts recently revealed that the spinner is nothing more than a regular toy. Fidget spinners have been marketed as easy to carry anxiety-busting gadgets that can aid children and adults with attention deficit hyperactive disorder (ADHD) and any type of anxiety disorder. The toys have become so popular that most stores can’t keep them in stock and schools have had to ban their use in the classroom. However, psychologists and experts have disclosed that even though the toys may seem to have positive impact on some people, there are no peer-reviewed studies conducted that can serve as scientific evidence of their therapeutic capabilities. In the United States alone, the Centers for Disease Control and Prevention (CDC) recorded 6.4 million children have ADHD. There are various methods used for managing the symptoms of autism, which include various types of fidgets. According to Dr. David Anderson, clinical psychologist and senior director of ADHD and Behavioral Disorders Center under the Child Mind Institute in New York, parents need to be wary when a product offers a quick-fix. Scott Kollins, clinical psychologist and professor at Duke University, said children and adults with ADHD are the most vulnerable to false claims and marketing. He also added that it’s important for parents of kids with ADHD and teachers who handle their cases to be informed that there are other ADHD and anxiety treatments that are thoroughly studied and documented. Dr. Anderson added that data available for parents searching for ADHD information only includes anecdotal examples from fidget spinner buyers. When parents rely on this information, it implies that Yelp reviews and other online reviews can be considered scientific. The claims of other experts is that “fidgets,” such as the silent and non-intrusive squeeze balls and the textured toys, like putty, enable them to experience brain stimulation that can help resolve hyperactivity in the classroom. This was refuted by Dr. Anderson when he said that those interventions are different from the impact of fidget spinners because said interventions enable movement while the fidget spinner is limited to fingers. 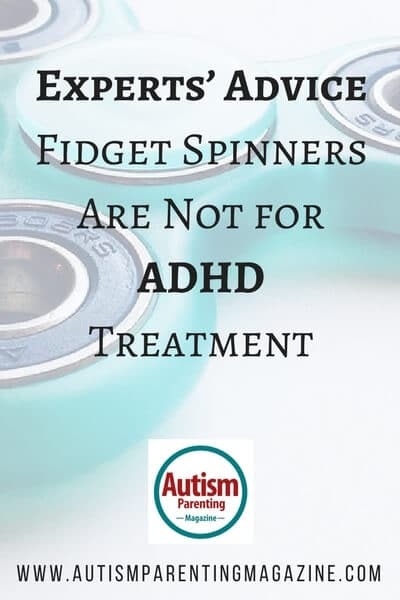 Several medical experts also expressed concern that the popularity of fidget spinners may distract parents of children with ADHD and the adult ADHD population from proven methods that work. Dr. Mark Stein, director of ADHD at the Seattle Children’s Hospital and a professor at the University of Washington, expressed his concern about the distraction that fidget spinners bring making people choose the wrong treatment methods. He added that families of people who have neurodevelopmental disorders are more vulnerable as they intend to try to do whatever they can for their loved one. ImpactADHD founder, Elaine Taylor-Klaus, also lamented that fidgets are in a bad light because of fidget spinners. ImpactADHD is a coaching service for parents whose children have ADHD. The fidget spinner was invented in the early 90’s by a chemical engineer Catherine Hettinger in an effort to entertain her daughter, but the product only became popular recently. While she held the patent on finger spinners for eight years, she had to surrender it because of the hefty renewal fee back in 2005. Hettinger has not made any money on her invention. Large stores have found it a challenge to keep the toys in stock over the past year. The team at Midtown Manhattan-based Almar Sales Co. was said to have sold 20 million fidget toys this past April, executive vice president Allen Ashkenazie told the New York Post.